This Is Hell! | Saturday on This is Hell! 9:20 - Political economist Andrew Fischer studies poverty, and the study of poverty, beyond the neoliberal frame. Andrew is author of Poverty as Ideology: Rescuing Social Justice from Global Development Agendas from Zed Books. 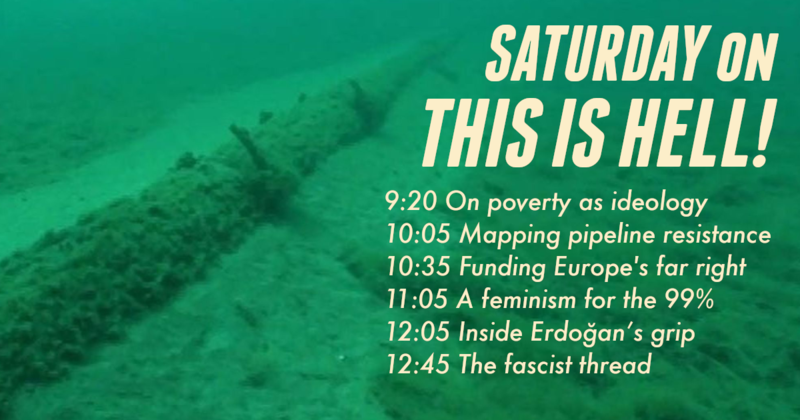 10:05 - Writers Duncan Tarr and Noor us-Sabah explore the Midwestern oil pipeline that ties us all together. Duncan and Noor wrote the article The End of the Line for Commune. 10:35 - Journalist Claire Provost traces money fueling Europe's far right back to US Christian fundamentalists. Claire Provost is co-author of the report Revealed: Trump-linked US Christian ‘fundamentalists’ pour millions of ‘dark money’ into Europe, boosting the far right from openDemocracy. 11:05 - Philosopher Cinzia Arruzza examines the anticapitalist, eco-socialist and antiracist reach of a feminist for all. Cinzia is co-author of Feminism for the 99%: A Manifesto from Verso. 12:05 - Live from Ankara, journalist Max Zirngast reports on Erdoğan’s autocratic grip tightening over Turkey. Max is co-author of the article Discontent Is Brewing In Erdoğan’s Turkey from Jacobin. 12:45 - In a Moment of Truth, Jeff Dorchen pulls a thread and unravels a unified conspiracy theory of fascism.